Google appreciates customer reviews so much that typically they will show up and get top billing even from other sources, like the one above from Yelp. Make no mistake REAL and positive reviews MUST be part of your local marketing. NEVER pay for phony reviews! The search engines are getting very good at detecting bogus reviews. Smart marketers do NOT try to game the system rather they have mechanisms to reward honest reviews and in doing so get the people who are posting these to do so honestly. So if you want your GMB listing to begin to perform better, getting regular reviews from a variety of your customers or clients are an absolute must. Every time clients or customers visit your store, hand them a business card with your Google My Business URL and asked them to take a moment to fill out a review and say something nice about the business. You should also have a hyperlink to your Google My Business listing on your website and encourage people to write reviews when you send them different types of e-mails, a weekly newsletter, or even consider running a contest to see who can write the best review. Google works best when you integrate their platforms together into a massive marketing platform. Google actively encourages businesses that have a Google My Business listing to also have a Google + account in interlink them together. Integrating the two together will allow you to perform additional marketing. This includes creating posts that customers can actually read and participate with, the ability to respond and interact with customers and clients, respond to reviews and more. The two together also allows you to utilize Google + with additional robust marketing tools, create multiple marketing channels, create powerful video presentations that can be shared in hangouts, and the list goes on and on. We will discuss Google + in the next section so that you can see the benefits and experience them as well as support your Google My Business page. Google + is a unique and powerful marketing platform, in and of itself. When you add Google + to your local marketing, this is like supercharging everything that you do and giving you some of the top marketing tools on the planet to do so with. Many marketers have completely changed their business just using these tools only. Creating excellent content has always been a fantastic way to make Google stand up and take notice of everything that you do. By simply doing daily posts about your business, posting testimonials, involving people directly in your ongoing story, you can attract lots of followers and interested people just using your Google + account. Taking the opportunity to claim this page with your business listed on it will allow you to fully customize this page and then once you do will allow your business to begin to show up on Google Maps. The synergistic effect of having both pages working together cannot be overstated. Google gives additional gravity when you use their tools as opposed to other local marketing tools, so why not utilize this tactic to increase the local searches? Cross-linking both pages validates each other and will further increase your gravity when it comes to local searches as well as doubling the opportunity for you and your business to appear before the eyes of your clients and customers. The “about us” section is located in your Google plus page is an excellent location to tell a short but powerful story about you and your business. The first few words should clearly define what your business is and have your most powerful keyword when doing so because this information will end up as your meta-tag data that will be shared throughout the search engines. Try to have a compelling headline that explains exactly why someone should click on this information to discover more about your business. Optimize the first 50 characters of all posts – Any and all posts that you do on Google + need to be optimized as well. Most marketers are aware of the importance of optimizing the first 50 characters of all posts, because this information is automatically converted into searchable and clickable link so that people can decide whether or not they wish to read more about your posts. This means you should include your main keyword in a short title that tells people exactly what they will be reading. Doing so will greatly increase the click through rate. You will experience and can drive additional traffic from your Google + page to your Google My Business page as well. Eventually it is possible when you have at least 1,000 followers on Google + to use plus post ads in order to boost the posts that you do, and drive more user engagement from followers and those who discover your page. Plus post ads are similar to Google Adwords and works on utilizing and displaying your posts to other like-minded individuals based on following, keywords and discovery. This is also similar to Facebook ads, where you are able to boost your posts in order to get more involvement and engagement from people that are in your newsfeed. This kind of advertising is actually affordable and if you have a reasonably large conversions such as a unique product or service that people are looking for, it may be well worth 20 bucks a day to reach these people and turn them into clients and customers. Depending on the type of engagement that you’re looking to have, plus post ads may be exactly what you’re looking for to immediately jump start and continue an ongoing engagement campaign where customers and clients begin to find you. Remember that you must build to your first 1,000 followers on Google + before you can utilize this advertising service. Similar to your Google My Business listing, your Google + page should be filled out completely and accurately to maximize search engine results. It is also important to reflect this same information across multiple Google platforms because this form of congruency adds to your search engine gravity. 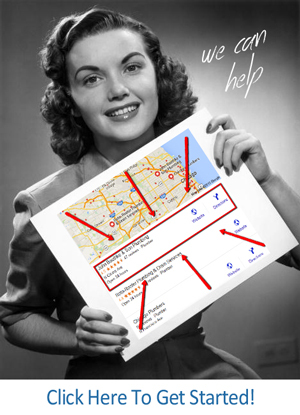 Make sure your business location is 100% accurate on Google maps. Add your main website link to your Google + page and also include a link to your Google My Business page. Ask customers and clients to add a review to your Google plus page and get them to click +1. Make sure that you list your hours of operation, local telephone number, local address and any other directional-based information to help clients and customers find you quickly. Most of these suggestions are absolutely critical to getting the most out of your Google Plus page and allowing integration between Google Plus and Google My Business. Remember that the search engines will “spider out” the links that are represented on your Google pages so interconnecting them is another great way to get a direct citation and/or thumbs up from Google.